We took all the best features from the Strider, Snare and Carbine packs and put them into the Hone. 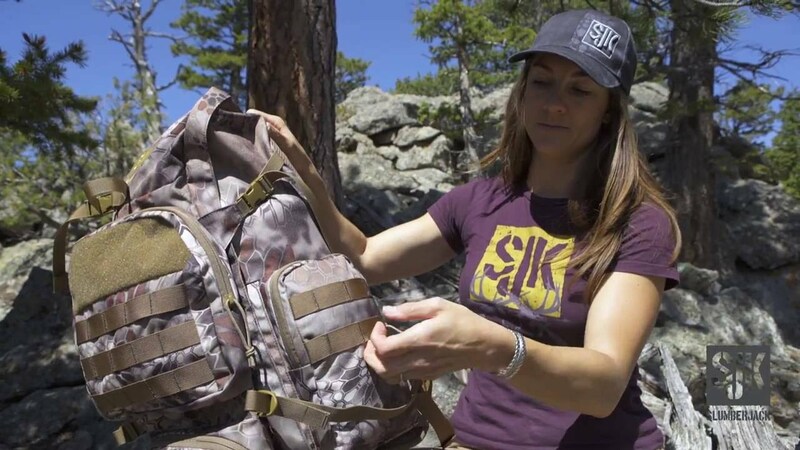 Thus, creating the ideal day pack for shed hunting, hiking or glassing ridge lines. It’s just big enough to haul out a quartered animal while still being low profile and sleek. This mid-sized daypack is an ideal blend of form, function, durability and a lightweight package. Never give up, Hone your skills and make it happen. Weight: 3 lbs. 4 oz. I love the pack. I've taken it sheep hunting in the Canadian Rockies, Tahr hunting in the liebig range of New Zealand and stag hunting in New Zealand and all I can say is it works great. Now for the hurt part. The shoulder straps are embarrassingly thin and unpadded compared to almost all other large hunting/trekking packs. I love it but I wish it didn't kill my shoulders to pack 80 ibs. It seems durable and well made. Pocket organization in the smaller front pockets is pretty good. It holds a 3 liter Camelback reservoir no problem. As it turned out, the side pockets and belt pockets were slightly too small for what I had planned for them, which was a big annoyance. Zippers on the belt pockets are impossible to operate with one hand and difficult with two if the pack is on, which makes removing the pack the best option most of the time for any accessibility. I’m not at all impressed with a center stay and “stiff” plastic sheet for load distribution. The plastic just bends into a taco around the center stay if the pack is overstuffed, making it feel like you put your arms through the handles of a duffel bag. Almost no back ventilation. It is very difficult to be quiet with this pack, with crinkly material that resonates when a zipper is pulled. It’s a great day hiker if the load isn’t big in volume, but so are a lot of less expensive packs. I might keep this one just for the picnic hikes with the family, but for sure I’m upping my hunting pack budget another $40 over the cost of this one and getting the small, external frame pack offered by one of the more popular pack manufacturers. This is a comfortable pack... on short trips. I have put some mile on this pack now and the biggest issue is a lack of adjustable load lifters on the harness. The way the pack is currently set up makes it hang lower on your back than you would like. You also are not able to keep it tight to your body without the adjustable load lifters. Personally I also like having stretch side pockets for water bottles because although these side pockets can fit a nalgene bottle, it will fall out if you bend over to tie your shoe. I typically use my bounty 4500 for day hunts, but this year I found myself with this Hone on a day buck hunt. We punched a buck tag 3.5 miles in and I didn't want to walk back to get my "pack out pack", so I loaded up the Hone and hope for the best. With a rear quarter, backstraps, and all my gear I made it back to camp feeling great and in zero pain. Love love love this pack! A Versatile Pack for EVERYTHING! Simply put: I love it! The Hone is the perfect sized pack for a day in the woods, everyday use, traveling, or, as I use it for, a Go Bag. I keep everything in it I would need if I had to leave the house in a hurry for whatever reason. It has just the right amount of pockets and I love the MOLLE system on the back! The only thing I think the pack is missing is some MOLLE loops on the waist belt for accessories. But that is a minor thing and doesn't bring down the overall quality of the pack in the least! All-in-all, this is the most versatile pack I have, it is the perfect size and style for a multitude of uses! Heck, I might even get another one (or two) so I can keep one as my Go Bag and have another for everyday use and hunting! Either way, I highly recommend it! Used this pack for a combination whitetail and mule deer hunt in southern Alberta. There was enough room for to handle my gear and clothing. Did help another pack out a mule deer (he only had a fanny pack) and had no problems or discomfort packing out meat and his rifle plus the gear that I had with me. Overall it is a great pack and will be my dedicated day pack for hunting and scouting. I bought this pack in September and have used it for 2 months. I've used it for day hunt trips and used it on a 10 day hunt for elk in NM. The support plate works awesome! I went through a lot of thorns and thickets and it didn't snag. The rifle rifle test worked pretty well. I could go on all day really. As for cons the only thing that I really don't like is the smaller pockets on the sides and at the bottom aren't double zipper. Past that, maybe a hydration bladder hangar support. Again wonderful pack and I recommend this to people and I hope they have the same experience I do!!! Good job kryptek!